Q: What does “Odayin” in the name “Camp Odayin” mean? A: The beautiful heartland of Minnesota is home to Ojibwa people. Our name derives its name from the Ojibwa word for heart, “odayin”. Q: What are Camp Odayin’s camper acceptance guidelines? A: Camp Odayin is a place specifically for children with heart disease. Although we do not accept or decline any campers over the phone or via e-mail, these guidelines are intended to help you as a parent determine if you should submit an application. Please contact us if you have questions prior to submitting an application. If the child has any other illnesses, disabilities (physical or developmental), or diseases, Camp Odayin will review those files on an individual basis and determine if Camp Odayin is an appropriate fit for the child. We regret that Camp Odayin does not have the facilities or the staff to care for children with developmental or physical disabilities unrelated to their hearts. Q: What if my child cannot or chooses not to participate in some of the camp activities? A: Our staff understands and respects the difference in each child. We try to make every activity available at many different levels, and hope your child will choose a level of participation in which they are comfortable. Q: As a family member of a camper, how can I volunteer? A: Volunteers are the heart of our program. Although we do not allow parents or family members of campers to volunteer as camp staff during the same week of camp their child is attending, we have many opportunities for parents and family members to volunteer throughout the year in our office, at fundraisers, etc. Please contact us to be included in these volunteer communications. Q: What is the goal of a Camp Odayin camp experience? Q: What is Camp Odayin’s non-discrimination policy? A: Camp Odayin serves all people regardless of race, color, creed, religion, national origin, gender identity and expression, sexual orientation, or socioeconomic status. Q: How does Camp Odayin support my camper’s gender identity? A: Per our non-discrimination policy, Camp Odayin is a safe and accepting place that supports the development of personal identities, free of fear and stigma when promoting self-expression. Our campers think of Odayin as a home away from home… a place where they are free to be their true selves. We couldn’t be more proud of this! Within the camper application, we ask: “Is there anything you would like to share about your child’s gender identity?” When a family responds in the affirmative, additional information is sought by Camp Odayin leadership. We work closely with families of campers that are transitioning to another gender or are identifying as another gender to ensure their child’s camp experience is positive. As with ALL Camp Odayin campers, we maintain a strict level of confidentiality and respect for anyone involved in our programs. If you have questions, please feel free to contact Executive Director, Sara Meslow at 651.351.9185. Q: What kind of medical attention and facilities are available to my child at Residential Camp? A: Camp Odayin is fully staffed with medical professionals. Two pediatric cardiologists are at camp for all five days, as well as a cardiac nurse per every 7-8 children. In addition, our camp counselors have been trained with basic cardiac knowledge. 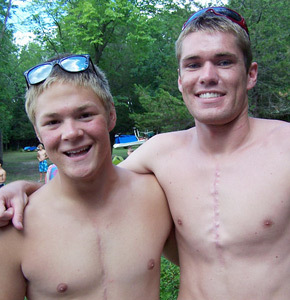 Camp Odayin has a fully equipped cardiac health center, which is staffed around the clock. A: Parents in our database will get an email from us with a link to online registration (available March 1st). The registration link will also be posted on our website and Facebook page at that time. Parents fill out their portion of the application and a confirmation email is sent to the parent letting them know their portion is completed. Minnesota Residential Camp applications are due May 1st and Wisconsin Residential Camp applications are due June 1st. All registrations are reviewed by the Camp Odayin Medical Director, Nursing Director and Executive Director. Parents are notified of camper acceptance in late-May for Minnesota camps and mid-June for Wisconsin camp. Payment made via credit card. There is the option to select $0 – Camp Odayin will cover your child’s cost to attend camp if you are unable. 4. General physical exam form – Your child will need to receive a general physical exam from a pediatrician (not their cardiologist). The Camper Physical Exam Form is completed and returned to Camp Odayin by May 1st for MN Residential Campers and June 1st for WI Residential Campers. NOTE: The physical exam is required in order for your child’s application to be considered complete. We encourage you to make the appointment soon. Please contact your insurance provider if you will need to arrange for an earlier physical. There will be an option for you to upload the physical document during the registration process, or you may fax or email after your child’s appointment. Q: Is transportation provided to Residential Camp? Angel Flight – a wonderful nonprofit organization providing flights to children for medical treatment or medically related camps. Families need to demonstrate a financial need to use Angel Flight services. Contact brooke@campodayin.org for additional information regarding Angel Flight. Q: What financial support is available to families? A: We are able to offer transportation scholarships for those in need. Up to $300 can be reimbursed for your travel costs. We are also able to cover your child’s cost to attend camp if you are unable. Contact the Camp Odayin office at info@campodayin.org if your family would benefit from financial support. Q: What kind of medical attention and facilities are available to my child at day camp? A: Camp Odayin is committed to your child’s safety. A cardiac nurse is always with the day camp group with the appropriate emergency first aid equipment including an AED and a pediatric cardiologist is on call. In addition, our counselors have been trained with basic cardiac knowledge. Q: Who will take care of my child’s medication while at camp? A: All medications that need to be distributed during Day Camp hours are kept and distributed by the nurse. A: All campers must arrive at camp by 9:00 am each morning. On Monday morning we invite parents to join us for the first half hour. We will use this time to fill you in on the week’s highlights and answer any of your questions. You may also discuss the possibility of carpooling with other families for the remainder of the week. A: Parents in our database will get an email from us with a link to online registration (available March 1st). The registration link will also be posted on our website and Facebook page at that time. Parents fill out their portion of the application and a confirmation email is sent to the parent letting them know their portion is completed. Day Camp applications are due July 1st and will be reviewed by the Camp Odayin Medical Director, Nursing Director and Executive Director. Parents are notified of camper acceptance in July. 4. General physical exam form – Your child will need to receive a general physical exam from a pediatrician (not their cardiologist). The Camper Physical Exam Form is completed and returned to Camp Odayin by July 1st for Day Campers. Q: My camper is not old enough to attend Camp Odayin in the summer; can we still attend Family Camp? A: YES! Family Camp is open to any family that has a child with heart disease. Q: What are the housing options at Family Camp? A: There are a wide variety of options for your family. We offer private housing, shared housing with another family, hotel style living, or more rustic cabins. We do our best to fulfill family requests to make your weekend wonderful. Q: When is Winter Camp? A: Winter Camp takes place each year over President’s Day weekend in February. Q: How do I know if my child is eligible to attend Winter Camp? Q: What transportation is provided to and from Winter Camp?